From time to time WordPress team has been releasing fixes & enhancement as new WordPress version. WordPress 2.9 which was released back in December 2009 and after three months, WordPress team is back with first beta version of its next major WordPress release that it WordPress 3.0. 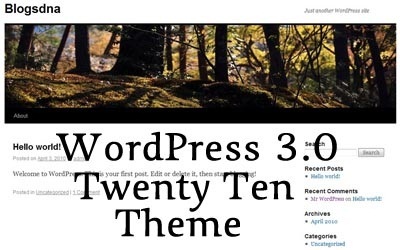 WordPress 3.0 will have many new features and enhancements including new WordPress theme “twenty ten”. With the intention of getting testers for WordPress 3.0, team has released first beta version with list of features users should checkout. Definitely WordPress 3.0 beta 1 is unfinished product and you may find issues or some UI bugs. In any case this should not be run on your primary website. If you really want to help WordPress team then do make sure to test out following features. 1. Test new default theme, Twenty Ten, including the custom background and header options. 3. WordPress MU users should test the multiple sites functionality to make sure nothing broke during the merge. Download WordPress 3.0 Beta 1. We are waiting for wp.3 main version. Just downloaded the install and I’m about to give a swing. Thanks for the link!